In nature, wild elephants may spend up to 80% of their day foraging for food and water. Guided by seasonal availability, as well as cultural wisdom passed down through generations, elephants are specially adapted to take advantage of whatever vegetation is available to satisfy their nutritional requirements. After the rainy season when grass is abundant, elephants consume large amounts of it. In dry seasons, elephants still consume grass, but also eat more tree bark, leaves, branches, and other "woody" plant material. The winter and early spring rains in Calaveras County have produced an abundance of tall, green grass at ARK 2000. The elephants spend long hours munching on this rich and bountiful delicacy as they traverse their spacious, natural habitats (African elephant Mara is pictured above.). We intuitively know that fresh vegetation is good for elephants, but what exactly are the benefits of these dietary components? Green, leafy vegetation is an excellent source of nutrients including vitamin E, a critically important component of elephant nutrition that contributes to a healthy immune system, and healthy skin, muscle and heart function. The very act of grazing has multiple benefits including reinforcement of social bonds, strengthening muscles, and engaging the mind and body in meaningful activity. The tip of an elephant's trunk is finely coordinated, strong, and shows remarkable dexterity when manipulating objects. When grazing, elephants tend to gather a bundle of grass with roots and soil attached to it. Each elephant has his or her own unique way of eating grass, as distinctive as the individual's personality. Maggie places a bunch of grass in just the right spot in her mouth, and uses her teeth to "snip" off the roots, letting them fall to ground before chewing and swallowing the leafy part of the grass. Toka will sometimes hold her grass bundles close to the ground and use one foot to break off the some of the root ball before chewing the rest. Gypsy taps her grass bundle against her leg or a tree to dislodge soil before eating. Nicholas not only loves to graze, but on occasion likes to wear clumps of grass on his head! Asian bull elephant Nicholas enjoys grazing in the tall grass in his habitat. At times he even chooses to wear some of it. Sadly, in many captive elephant facilities, grass is either sparse or non-existent. In these places, elephants subsist on hay, pellets, vegetables and fruit provided by human keepers. If grass does exist near elephant enclosures, it is usually for the purpose of making the area aesthetically pleasing to the zoo visitor. Trees, plants and grass inside the enclosures are typically surrounded by electrified "hot wire" to prevent the elephants from eating them. 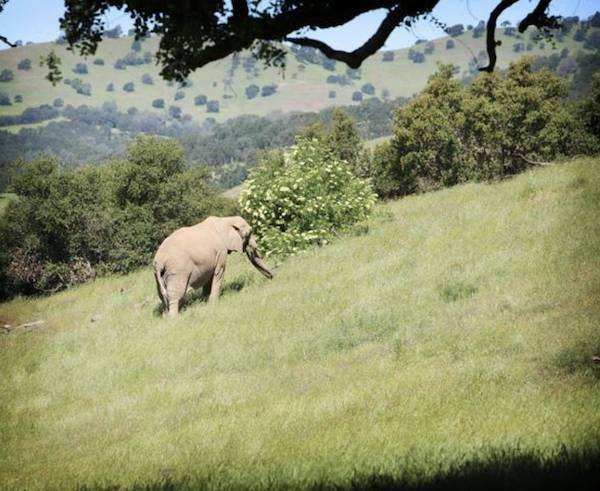 Not so at PAWS' ARK 2000 sanctuary, where every habitat has a variety of seasonal grasses, trees and other year-round vegetation for the elephants to enjoy to their hearts' content. In addition, PAWS elephants are also provided with a variety of browse, fruits, vegetables, pellets and hay to ensure that all of their nutritional needs are met.